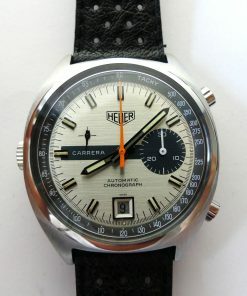 Specialist for Heuer Chronographs since 2006. 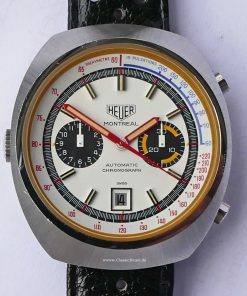 Very popular Heuer Montreal with white dial. 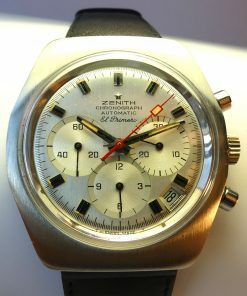 The automatic Chronograph Ref. 110.503W with the caliber 12 is from the year 1972. 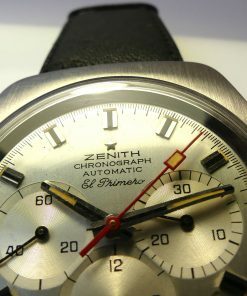 The watch is in an unworn NOS (new-old-stock) condition with protective glaze on the back cover. White dial with two black registers and date at 6 o’clock. This model of the Montreal impresses with its contrasting optics with red and blue scales and yellow / red hands on a white dial. With black leather strap and Heuer buckle. An extremely rare collector’s item in an authentic and unpolished condition. Bitte füllen Sie dieses Formular aus. Wir werden uns anschließend schnellstmöglich bei Ihnen melden. Please fill out this form. We will contact you as soon as possible. Ich stimme zu, dass meine Angaben aus dem Kontaktformular zur Beantwortung meiner Anfrage erhoben und verarbeitet werden. Weitere Informationen zum Umgang mit Nutzerdaten und Widerrufshinweise finden Sie in unserer Datenschutzerklärung. Hinweis: Alle Uhren, die wir in unserem Angebot haben, sind in einem hochwertigen Zustand. Bei den meisten Uhren handelt es sich um Sammlerstücke, die entsprechend gepflegt wurden. Alle angebotenen Uhren wurden in unserer Meisterwerkstatt auf Ihre Funktionsfähigkeit überprüft. Sie haben einen vollständigen Service erhalten. 1 Jahr Gewährleistung. Alle zum Angebot stehenden Uhren sind nicht mehr wasserdicht. Guideline: All watches offered on this website are in excellent condition. Mainly collectible items will be provided for sale. 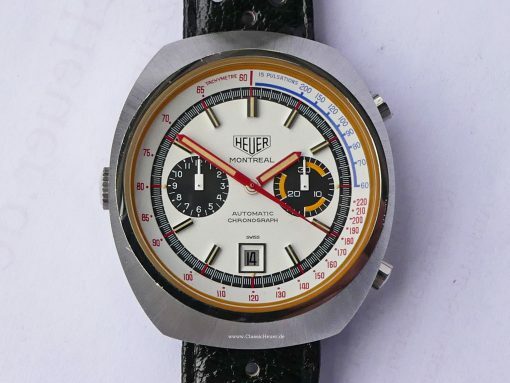 Accordingly the chronographs are in well-tended condition. The movements have all been serviced. All the presented chronographs and watches are completely checked by our master watchmaker regarding their functionality. 1 year warranty. All watches we offer are no longer waterproof. Specialising in high-quality chronographes from the sixties and seventies ClassicHeuer offers a range of new-old-stock and first-class used watches. Primarily chronographs from the former manufacturer Heuer, which has been producing legendary timepieces since 1860. 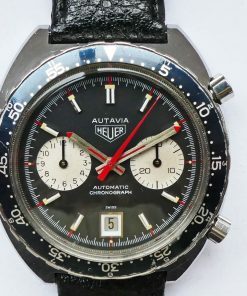 It is worth to have a look at ClassicHeuer website even you are looking for chronographs from Breitling, Omega, Rolex, Orfina Porsche Design and other motorsport related timepieces. 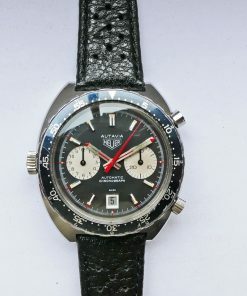 This website is not an official TAG Heuer website and is not affiliated in any way to TAG Heuer.